When Henri Mouhout, a French naturalist, discovered the ruins of Angkor in 1860, he was astounded by its immense complex of temples. Boasting over 70 monuments spread over an area of 200 square kilometers, perhaps only the structures along Egypt’s Nile River could compare. Some felt that only the legions of Alexander the Great could have accomplished such a feat, yet it took an entire civilization to build it. Angkor is a majestic display of vision, tribute and aesthetics that features amazing diversity in style and method. Angkor, an anonymous work, is the subject of Rolfe Horn’s first book. Like the places they depict, there is a familiarity to Horn’s images, but there is a subtlety here that demands attention. The interplay of surface and depth directs our eyes over every inch of the images, leaving us to contemplate the existence of simple beauty. These images give us insight not only into the beauty of the medium and the subject matter, but also into that of existence… more specifically, ours. 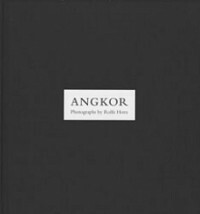 Printed in an edition of 100 numbered and signed copies, each copy of Angkor contains 12 original silver gelatin photographs, printed and archivally processed by the artist. Slipcased, with an introduction by Garrison Beau Scott.